A friend on Facebook shared a post asking for the most outrageous experience you had in which a black or brown person would've been in serious jeopardy. Back when my Mom's store was moving down the block, and my brother and I were moving the contents of the basement into our minivan. When everything else was moved, we considered this hotel safe that had been left by another tenant in the building years before, and decided that we should take it with us because we'd always thought of trying to see if we could crack it, and it was my Mom's as much as it was anyone's. 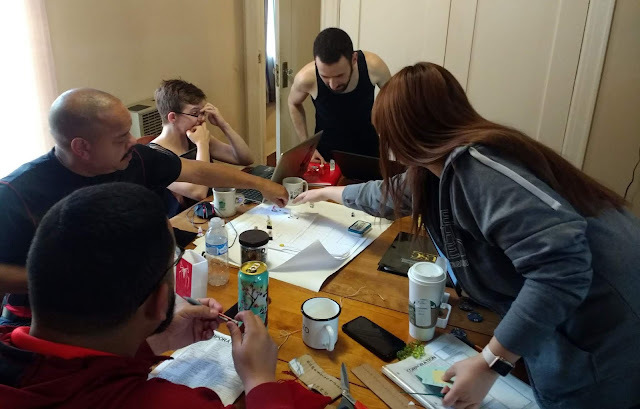 RPG Stories: "Corporation: The Missing Element"
I've been running a table top game with friends for a while that takes place in a cyberpunk future, and recently had what felt like an exceptional session. Jack was visiting from Austin for the weekend, and so members of our D&D group arranged to meet for an unusual Saturday session. Normally we play short little weekday sessions from 8 - 10. The mission was called "The Hidden Element", and began with the members of their squad fighting their way through the White House to rescue President Kennedy from Osama Bin Hitler when an urgent summons interrupted the VR training simulation they were conducting. A rare scientific artifact had gone missing at a physics conference on a South Pacific island research center. Northam's disgusting yearbook photos have drawn understandable demands for him to resign. But before we close the book on this story, there is a second story that seems to be going unnoticed. Respectable news sources including the New York Times reported that offensive photos of the governor had been discovered. In the course of their reporting, though, they haven't examined that they were uncovered by a White Nationalist publication specifically for the purpose of creating a controversy to drive the Alt-right's agenda. The reason that this angers me is not that it's somehow unfair to Northam, who has no entitlement to defense over the racist attitudes his costume displayed. It's because the inclusion or omission of this information substantially alters the context of the story as we all decide the appropriate response to Northam's past wrong. 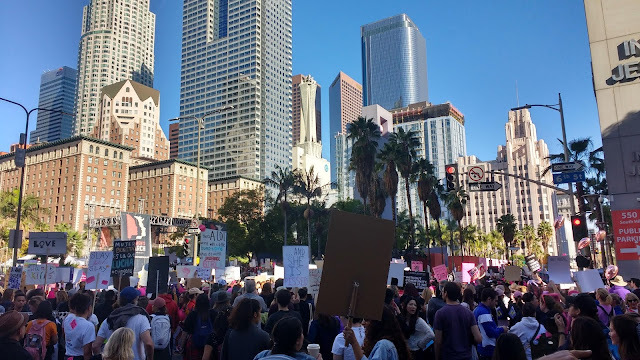 I attended the Women's March in down town LA this morning. The biggest takeaway for me was when speakers or protesters described undocumented families facing deportation or separation as our neighbors. As a Jew, I know that my ancestors have faced pogroms where angry mobs sought to drive them out by threatening their lives and livelihoods. It chokes me up when I imagine people who only want an opportunity to live in peace facing that kind of hate in America, MY country. But it's reassuring to see that as long as hundreds of thousands of people are angry enough to keep marching and agreeing to stand up and protect our neighbors, we can make a stronger and safer America. Here are a few of the signs. I'm very disappointed with Nancy Pelosi's response to the government shutdown. Obviously, I'm far more than disappointed with Donald Trump's decision to shut the government down, and I don't really like Chuck Schumer's response, either. But I highlight Pelosi because she's the only one of these three with some influence and who isn't the person who is shutting down the government. I'm disappointed because Nancy Pelosi is doing exactly what anyone would expect her to do, which is doing nothing and letting a disaster unfold that will damage her opposition's political standing. The problem is that this strategy makes no consideration whatsoever for thousands of people who are falling into permanent economic hardship due to this shutdown.